This is a sponsored post written by me on behalf of Dollar General. All opinions are 100% mine. 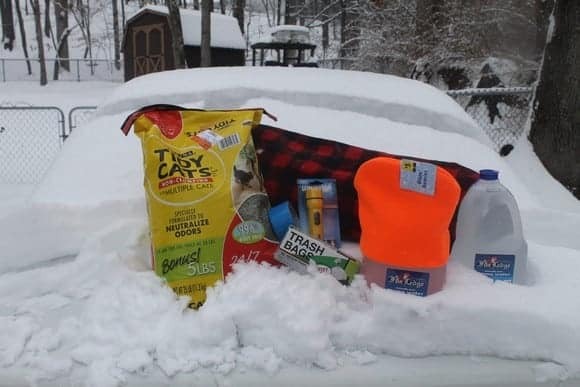 If you live in a cold and snowy region, creating a winter car emergency kit is pretty much essential. Given the fact that it just snowed a foot in parts of Texas, I’d say it’s essential even if you DON’T live in an area known for frigid winters! I happen to live in the Poconos, a place known for its snow, so preparing for winter is practically an Olympic sport for us! I’ve found myself in some scary situations with my car in the winter. Thankfully, they usually happened close to home! Now that my poor old car is struggling on good days, though, I have this major fear of breaking down in the middle of nowhere on a cold night. In my nightmare, it suddenly starts to snow. Since the weather is so unpredictable lately, this nightmare can easily become reality. So now, I’m keeping a winter car emergency kit handy! Usually, I go to Dollar General without a plan and let inspiration strike as I’m browsing. This time, though, I had more specific ideas in mind. Before you go shopping for your winter car emergency kit essentials, take a look around your house. You probably have some of the bigger, more expensive supplies on hand. If not, don’t worry, you can get them at Dollar General. Blanket- make sure it’s big enough to wrap around yourself. If you go with an old comforter, you can huddle in the back seat with your family under it. If you opt for smaller fleece blankets, get one for everyone in the family. Individual blankets are better if you end up having to walk in the cold. Water- I grabbed two one-gallon jugs of water at Dollar General to keep in my trunk. I figure the larger volume of water won’t freeze as fast as individual bottles. Flashlight- This one is pretty obvious. You should always keep a flashlight in your car, no matter what season it is. Check the batteries frequently to make sure they’re still good. White garbage bags- Garbage bags have so many purposes when you’re stuck in the winter. They can be used as ponchos over your clothes to keep you dryer or wrapped around your shoes to keep your feet dry if you have to walk. White garbage bags are also useful for letting rescue vehicles find you. Roll down your window a bit, then stick the bag about three-quarters of the way out. Roll up the window. It acts as a “white flag” to indicate that you need help. Bright colored duct tape-After I got home, I started thinking “what if it’s daytime and snowing? How will anyone see the white bag? Then I remembered that I still had bright blue duct tape left over from our Dollar General back to school snack bin project. That gave me an idea! If it’s snowing out, simply tape a few bright strips to your white garbage bag. Get a color that will really stand out. Duct tape also lets you seal any window drafts, holds those garbage bags around your feet and so much more. 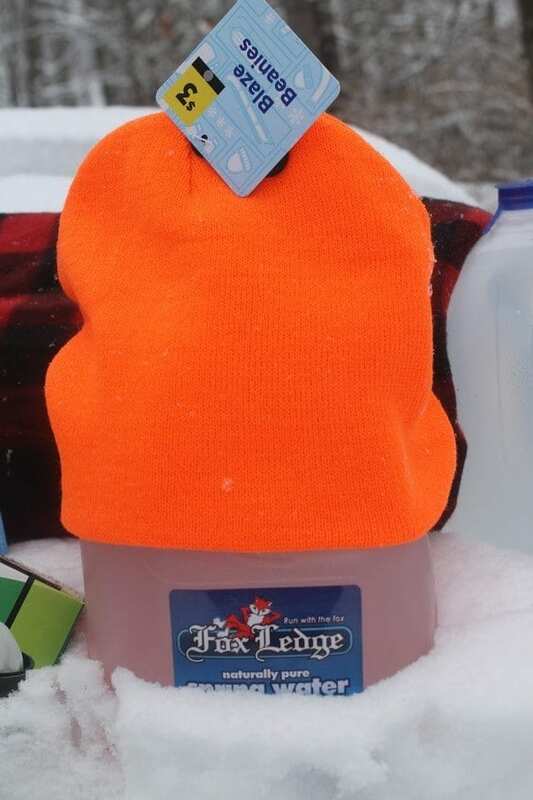 Bright colored hat. If you end up walking or standing outside your car for any reason in the dark, a bright-colored hat will help other drivers see you on the road. I picked up an insanely orange hat for about $3 at Dollar General. Since it’s so not me, there’s no chance I’ll take it out of my trunk and forget it at home! Dollar General also sells rock salt for melting ice. Alas, like the cheapest kitty litter, it was gone. Our entire town is pretty much sold out right now. That’s what happens when you go shopping between ice storms! I’m also assuming that you have basics like an ice-scraper, de-icer spray and whatnot. Keeping all of these items in your trunk may not stop bad weather from causing problems with your car, but at least you’ll be more prepared for emergencies! I’m hardly an expert on cars, so if you can you think of any winter car emergency kit essentials that I forgot, tell us in the comments! I’ll be sure to add it to my kit! add jumper cables, a first aid kit , may be a can of fix a flat. non perishable food and water. I am so glad I don’t have to start dealing with snow. These tips are so helpful and always be prepared! I have most of the stuff you mentioned in my car. The only missing ones are the garbage bags and bright colored clothing. I will remember to keep them now. These are great for that inter storm that’s coming through! I’m in Florida so luckily I’m safe. I have a kit in my car. I don’t have garbage bags, but that’s a nice tip! Having an emergency kit in the car is so important. I always stress to my husband the importance of being prepared in an emergency. I love your trick with the tape. Very clever! A car emergency kit is a must, especially during the winter months. These are all great ideas. I have a few things in my trunk like a roadside kit and a fleece blanket. I’ve known to carry the kitty litter, but I never think to grab any for the car. I’ve learned it is always better to be safe than sorry. This is an awesome kit! I am so thankful for this post. I recently had a car emergency that I was totally unprepared for and afterward realized that I needed a car kit but I didn’t have any idea of where to start. This post has given me the information I need to create something that won’t leave me unprepared in the event of another emergency. Thank you again!!! It’s so important to have these supplies. And I’m missing a few of them! These are all great tips.We always have a lot of things in the car that can help us out should we need it. These are all such wonderful, important tips! We don’t get alot of snow here in SC but we do every once in awhile and everything shuts down. It would be nice to know this was in the back of the car! I live in Florida so most of these I would not need but definitely a flash light is a must! It is great that you are prepared! We live in Southern California so we don’t really have to worry about winter but these are great ideas all year long. Having kitty litter and rock salt in your car are essential. I always keep a blanket in my car in the winter too. I’m secretly jealous of that SNOW! We do not get much here but this kit is smart. These are great ideas and it’s awesome you can find everything for good prices. I’ll have to pass the cat litter idea to my kids up north. This is the perfect kit to have – I have carried a small folding shovel and the rest – I was required to when I ran conference centers in the alpines and snow! Someone in our family made the mistake of dumping the clumping cat litter on our driveway one year. (Someone is no longer allowed to help the driveway.) This is a great list. I need to grab a few of these items for my car asap. Oh Wow! We don’t need anything like this where I am at. This would be useful if we travel where the conditions are much more severe. Last year I got some of the thermal emergency blankets for my car. They came highly recommended and take up about a square inch of space. Okay, I live in Florida, so I know nothing about cars in the snow, but this looks like a fantastic kit! I could put together one for bad weather here, for sure! That is a great idea. I need to stock up on supplies. What’s the Best Car for Using 3 Car Seats in the Back Seat?